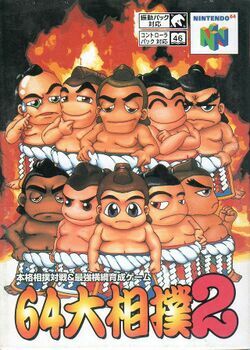 64 Oozumou 2 (Rokujuuyon Oozumou Ni, 64 Professional Sumo Wrestling 2?) is a sequel tp 64 Oozumou which was only released in Japan on March 19, 1999 for the Nintendo 64. Like its predecessor, the gameplay simulates various aspects of a sumo wrestler's life. This page was last edited on 21 April 2015, at 00:34.